YES You Can Make Money Writing! Besides publishing books my goal was to get paid for writing magazine articles. But first I did my time. I wrote for local papers for free to get exposed and used to the tighter style of writing and meeting a deadline. The first time I was published in Our Canada, a national glossy magazine, even though it was unpaid I was thrilled. What I got out of it was book sales, a free subscription and a place to stay in Ontario. Being an RV writer, I started with RV Times also for free. Writing a series on our cross-Canada trips sold books, and created a fan base which continues to this day. I couldn’t join BC Association of Travel Writers unless I sold at least two articles per year because this is an organization of professionals. The first year I scrimped to sell two. But by the next year Snowbirds & RV Travel found me and paid for the 10 part series about our 2009 northern trip. This year after the BCATW gala, an invitation went out for three travel writers to go to Dawson City, Yukon all expenses paid. Yahoo!! I finally felt like I belonged among the other professional travel writers. No more writing for free, or at least minimally and only under special circumstances like for Powell River Living. Those four days in Dawson was the pinnacle of my travel writing career. I was treated like royalty by tourism and business people alike. Three of us were wined and dined, toured around, given gifts and taken to the Commissioners Ball. The 1898 style ball is formal with dresses being specially designed starting at $2,000. Do I ever have stories! 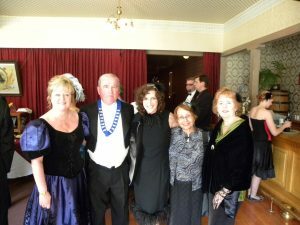 I did my homework ahead of time, contacting the seamstress, the commissioner’s office and an editor for a Yukon magazine.In the photo below with my two other travel writer friends at the Commissions Ball. If you can make out the little feather headpieces we’re wearing they were gifts from our Yukon Tourism host. Oh the perks! Could you earn an income with your stories or enjoy what are called “fam tours”/ familiarization tours put on by tourism …YES You Can! Haven’t started yet? Start writing for free in local magazines to build up a portfolio of clips/tear sheets. Set a goal for when you’ll start selling stories. Writing is a job and we deserve to get paid just the same as the ad person does. Among the professionals, it’s a sore point when writers give their work away because it makes it harder for the rest of us to find editors that will pay. Start small, learn as you go, attend workshops, pick the brain of experienced magazine writers, study articles in magazines for content and structure.